NRC performed a significant loading, transportation and disposal of project during the fall of 2010. The project included the intermodal transportation of 15,040 tons of contaminated soil via gondola style railcars, bulk highway containers, and bulk loading on the covered deck of a barge from the Port of Anchorage to the Port of Seattle, all performed without incident accordance with all Federal, State, and Local regulations. The soil was transported via a combination of packaging and shipping methods to provide the timely and safe transportation and disposal of the accumulated soil. Over 11, 500 tons of material was moved in bulk via a barge shipped from the Port of Anchorage. NRC installed an impervious liner over the deck of the barge and secure it adequately during the soil loading operation. 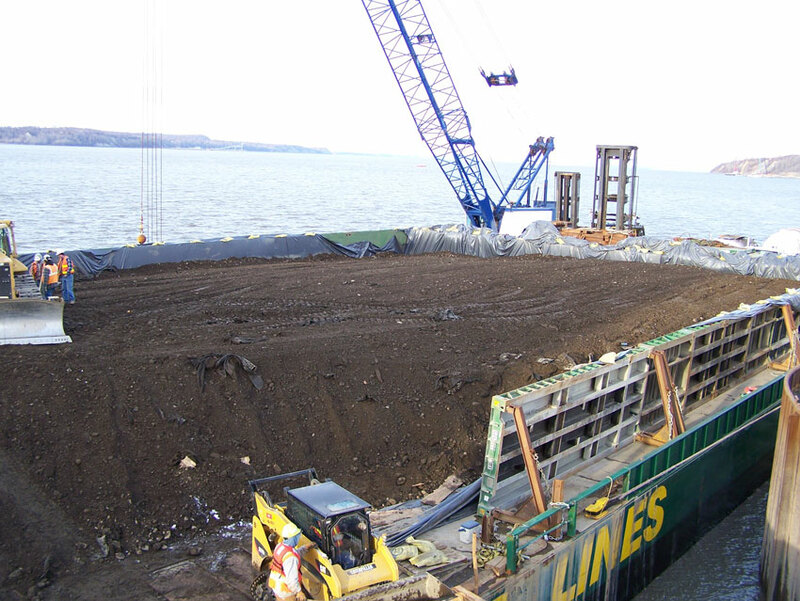 Soil was loaded across the dock and on-board by a tip-able crane operated bulk soil container which was filled by dump trucks at the dock location. Side dumping trucks with a 25 ton capacity was the preferred method of receiving contaminated soil from the project stockpiles. Upon completion of the deck loading, another impervious liner was installed as a cover and secured with rope lashing and weighted sandbags in a fashion that effectively sealed the entire load from the elements during the 10-day marine voyage to the Port of Seattle. The entire barge load was towed by a US Coast Guard Certified tug boat of adequate power to the offloading facility in Seattle Washington. In Seattle the barge was again securely docked, uncovered, and offloaded by containerization for outbound shipping to the landfill disposal site. NRC also spotted 90-ton capacity gondola style rail cars to a rail spur located near the project site. NRC provided the entire coordination efforts between the Alaska Railroad relating to the positioning and scheduling of empty cars and removal of filled cars. We also responsible for the Alaska Railroad’s safety protocols surrounding the movement of cars along the siding, including the releasing and setting of manual brakes and manual de-railing devices. Engineered and integrated car liners and covers were provided for each car. We provided personnel and equipment to install all gondola liners prior to filling with soil and also completed the cover installation process after filling. Lastly, NRC arranged for the spotting of 75 individual 20-ton gross weight intermodal 20-foot open top containers to the project site. 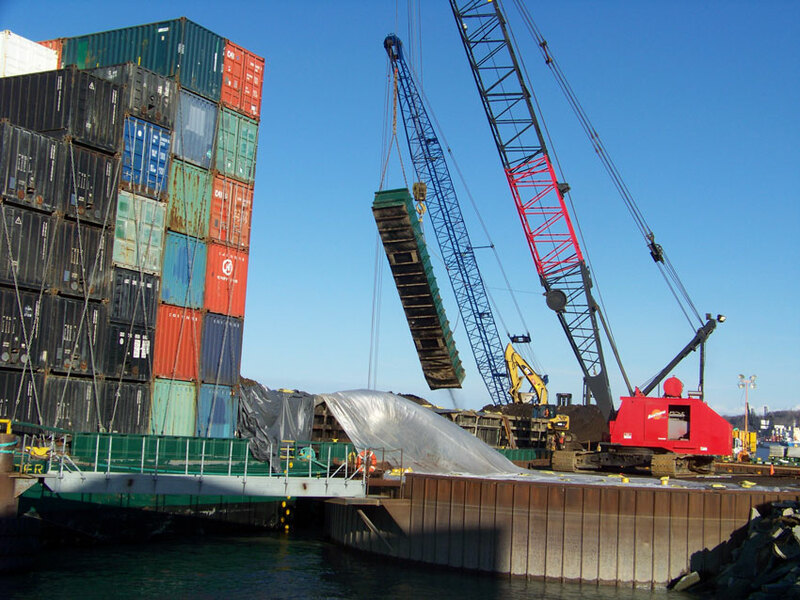 For the loading of soil into Bulk Intermodal containers, personnel removed the container covers, installed the liners, and reinstalled the covers to ensure that all transportation was conducted without leaks, spills, or water infiltration. The entire operation was overseen by a trained and qualified Transportation and Disposal Coordinator following a written and approved Transportation and Disposal Plan specifically prepared for the project.